IncrediBarcode is a 100%-managed .NET class library that adds powerful and comprehensive Barcode capabilities to your .NET applications. 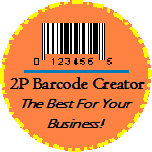 With Barcode Generator you can easily create barcode images of unlimited resolution. Barcode Generator supports many popular bar coding symbologies, automatically calculates the check digit, and lets you export barcodes to poplar graphic formats.